Gardening To Fill The Pantry! 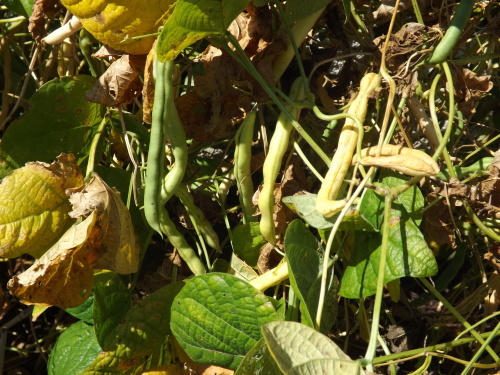 Last year I planted an entire 4 x 6 foot section of the garden with bush and pole beans. The results were better than I had hoped. For weeks we harvested tons of beans and the flowers just kept coming. No matter how many I picked, there were still more out there. I gave them to neighbors, family, and friends until finally no one wanted anymore. Then I started canning and freezing. I canned more dill beans than we’ll possibly eat in two years and froze enough for at least a year. 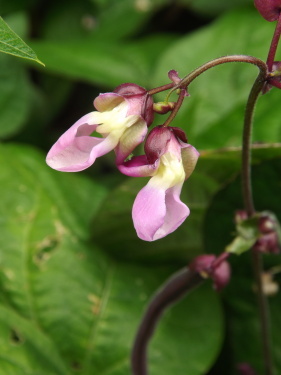 Finally at the end of the season, sometime in late October, when all the beans were finally done flowering, I left all the pods on the plants until they dried. This took until mid-November. 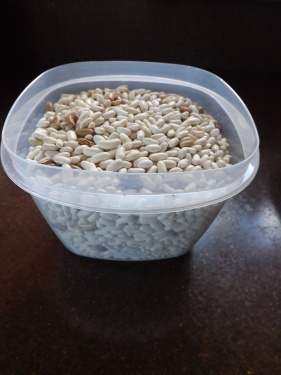 Not having the time or inclination to do anything with them then, I put the beans in a plastic bag and stored them in the garage, with the intention of shelling them during the winter and then canning the dry beans for bean soup and other bean dishes. 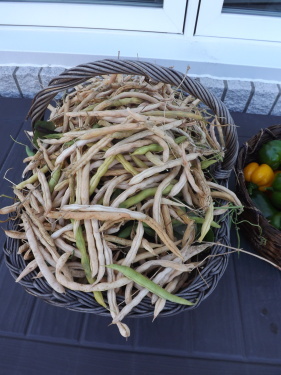 I mean what could be better than home-grown dry beans. There was no way I wanted these beans to go to waste. 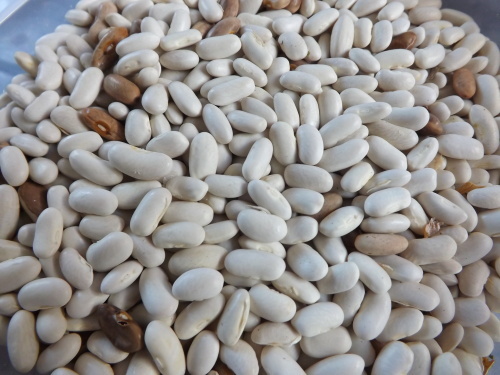 All winter those beans sat in the garage waiting to be shelled, but knowing they were there inspired me to plan on planting beans again this year for the sole purpose of letting them dry and using them that way. So when the weather broke and the ground was warm enough I planted an entire section of garden with bean plants, excited to be so clever in growing my own dry beans. Well rather than plant the beans as I had last year, even though I had great success, I had a better idea and decided to try something new. It flopped. I’m not sure why, but I’ll get to that in another post. 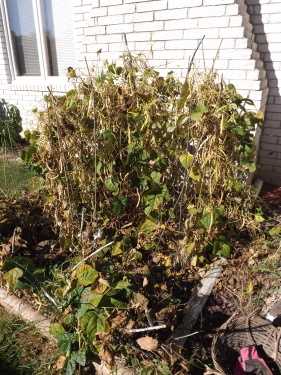 Regardless, there will be no beans from our garden this year. 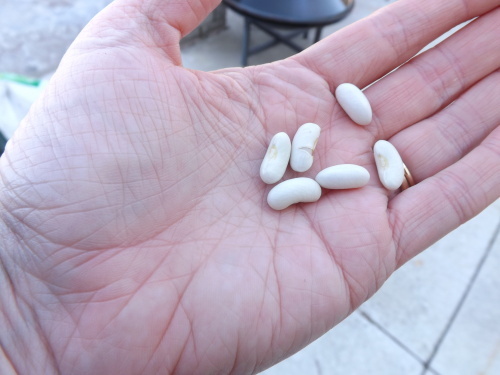 Thoroughly disappointed and disgusted with myself because I hadn’t stuck with what had worked, I sat down a few days ago on the patio and decided to finally shell all the beans from 2015. For two days I worked on shelling a garbage bag full of beans, separating them from their hard shells and placing the wonderful little gems in a bowl. All my effort and we ended up with 2 pounds 14 ounces of dry beans. Well that was rather humbling. Sure it’s great to be all self-sufficient and all, but I don’t know that I’ll be planting beans just so I can dry them. That is unless there is some sort of shortage on dried beans or they suddenly become GMO infested. No, this is one crop I don’t think is worth the time and effort. I will definitely be planting beans again, probably next year. 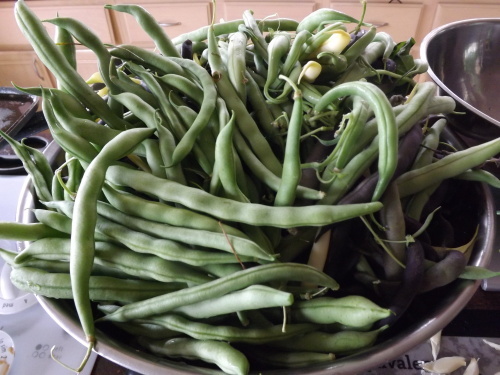 If I end up with a great bumper crop and have a ton of beans left on the plants, I won’t let them go to waste, but I am absolutely not going to plant beans just so I can dry them for the pantry. This experience has proven once again, “Everything happens for a reason.” My bean plants flopping this year and not even sprouting was Mother Nature’s way of looking out for me, and for this I am — Simply Grateful. 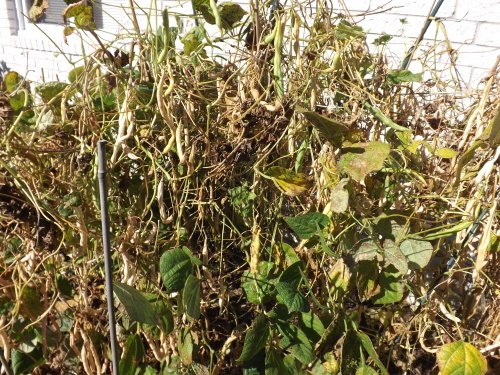 Categories: Beans | Tags: Bean, Drying Beans, Gardening | Permalink. Our house will probably forever more be called “The House of Many Milk Cartons.” Hubby lovingly/mockingly referred to our house as this as I’ve been collecting them since last summer and since work began outside for the garden expansion and preparation for seedlings, it looks as if we are growing them! 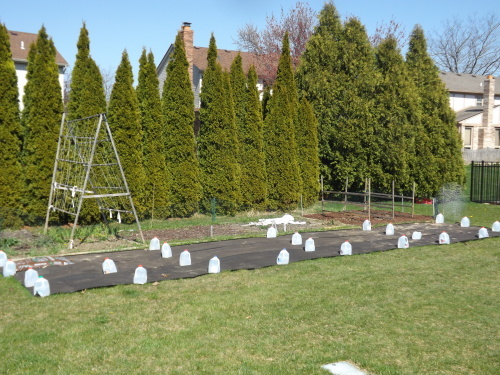 As soon as the snow melted in the early spring, I laid out tar paper to kill the grass for the new garden expansion. Milk cartons filled with water were used to hold the paper in place. 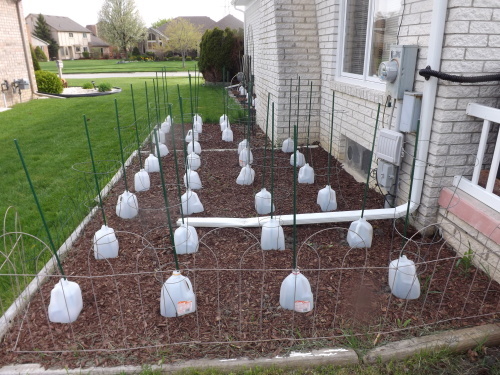 Once the cartons were done being used to hold down the tar paper, I emptied the water into a rain barrel and cut them down so when the pepper garden is ready to be staked out, I can use them when the plants are moved from the greenhouse to the ground. 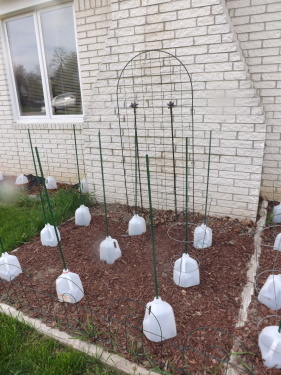 When the tomato garden was turned over and the soil readied for planting, I staked out where the plants would go once the weather was warm enough to transplant the seedlings and a milk carton (bottom removed) was placed over the stake. The milk cartons will allow me to transplant the seedlings directly from the greenhouse to the garden without worrying about hardening them off. I just need to make sure the temps stay above 50 degrees. The milk cartons are also being used to insulate bean seeds that have been planted directly in the ground. With mulch sealing the bottom edges of the carton to the ground, the ground is kept warm enough for the seeds to get an early start. There are a ton of uses for milk cartons in gardening. 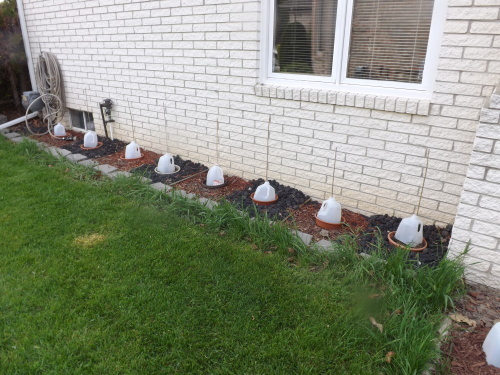 I use them to hold liquid plant food mixes, as scoops for transferring soil to pots, and as weights to hold down tarps or sheets when covering plants to protect them from frost. Being able to reuse these in a productive way — upcycling, is something I am always on the lookout for when it comes to my garden. For the next month or so our yard will be full of milk cartons, probably much to our neighbors dismay. As for me, I’m glad to be able to use them to protect my plants and make quick work of many gardening projects, and for this I am — Simply Grateful. Categories: Beans, Garden Gadgets, Garden Prep, Tomatoes, Uncategorized | Tags: Beans, Garden Expansion, Garden Gadgets, Gardening, Milk Cartons, Tomatoes, Upcycling | Permalink. Why Aren't My Carrots Growing?